The Media Library lists all the files uploaded to your site. 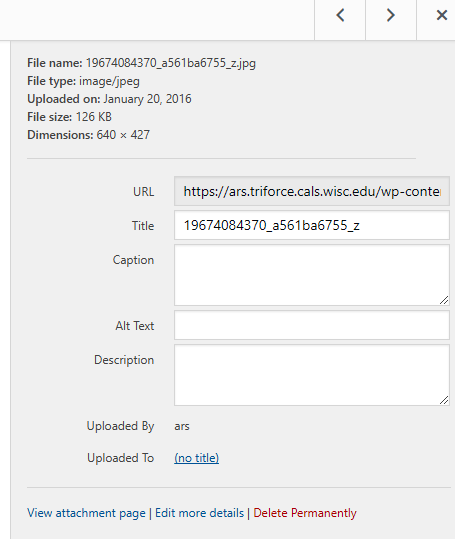 You can also see the file sizes and other details, including the Pages or Posts where the files were inserted. 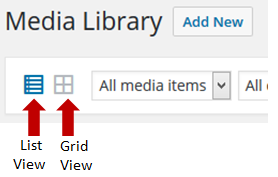 The Media Library screen has two views – grid view and list view. Grid view (shown above) is the default, and file icons for most files, or thumbnails for images. 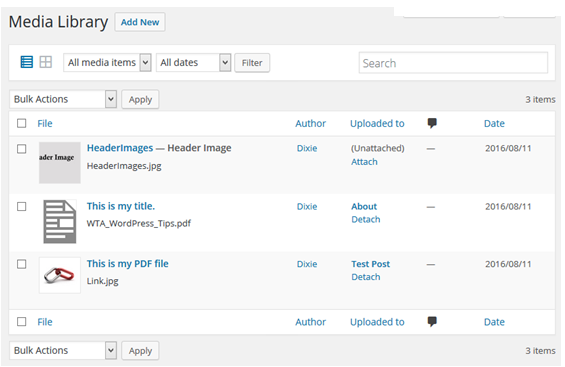 List view (shown below) shows the file name, the author, where the file was uploaded to, and the date. Note: The search function on this screen isn’t perfect. The most reliable way to find files is to page through the images. 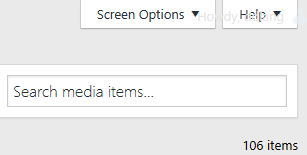 Tip: Files rapidly accumulate in the Media Library, and searching can soon turn into trying to find a needle in a haystack. Take a minute or two BEFORE you upload the file to give it a meaningful name. This is particularly important with photos and slide show images. Use initial caps, no spaces (use dashes instead), no slashes, and no periods (except the file extension) or semicolons. The default sort order is ascending. Click the column header again to reverse the sort order. Tip: You can select and copy the URL and paste it into an email, and Office file, or into a page or post on another website.